The stock market has had a great start to 2019 as the S&P 500 is up 4.13%. Netflix is considered a poster child for the momentum trade because it has a high valuation and a volatile stock. Netflix is already up 35% on the year. Be careful when looking at the price action. It’s best to look at the economic data and earnings reports because the fundamentals don’t change from day to day. It’s easier to get in front of macro analysis than it is to trade volatile stocks on a day to day basis. The table above is probably something you want to ignore even though it is tempting to follow. 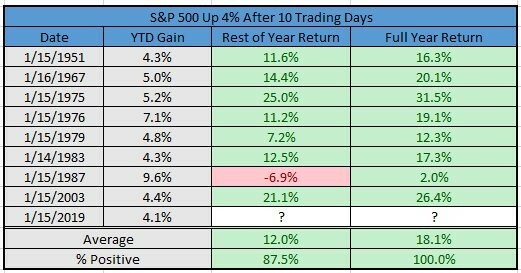 As you can see, when the S&P 500 increases at least 4% in the first 10 trading days, the rest of the year is up 7 out of 8 times and the full year returns are positive every year. One crushing blow to this table is that the December 2018 returns were worse than all the Decembers leading up to these January gains in this table. The stock market started the year very oversold. Usually, January tells us how the year will go, but this January only tells us December was terrible. As we mentioned, earnings reports are more important than short term price action. Out of the first 36 S&P 500 firms that have reported Q4 earnings, EPS growth is 22.77% which is below last quarter’s growth of 24.2%. Sales growth is 7.63% which is below last quarter’s growth of 8.35%. It was tougher to grow sales than EPS in 2018 because profits were boosted by the tax cut. With much of the government economic data not being reported because of the 26 day government shutdown (the longest in history), alternative data is more valuable. It’s also more important to listen to managements’ commentary on earnings calls. One example of a non-government created economic report that has a lot of value to macro investors is the Cass Freight Shipment index. The Cass Freight index measures freight volumes. The index is made up of 400 different companies and manufacturers. 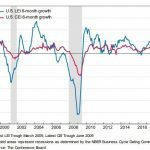 The index shows economic growth this cycle peaked in January. This coincided perfectly with the stock market peak last year before the summer rally ruined it. 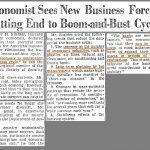 The economy is cyclical, and the changes are slow. It’s very clear GDP growth peaked in Q2 2018. Growth has slowed every quarter since then. It will likely continue slowing in Q4 as GDP growth is expected to be 2.8%. The government shutdown will hurt Q1 2019 GDP growth, but this one time effect should be ignored as the trend is what matters. The Cass Freight index’s comparisons will get tougher in the next few months. As you can see, November barely had any growth and its comp isn’t nearly as tough as the January comp. Now let’s fast forward to the latest soft data economic report from January. The Empire Fed manufacturing survey measures how manufacturing is doing in the New York Fed district. 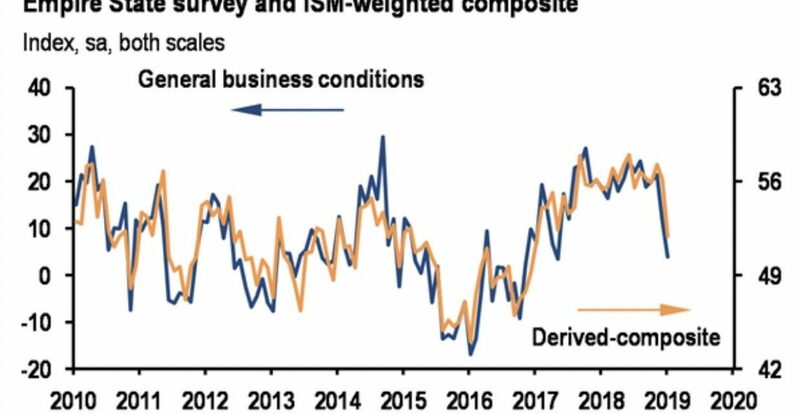 The Empire Fed’s general business conditions index fell from 11.5 to only 3.9. This was way below the consensus for 12 and the low end of the estimate range which was 8.9. 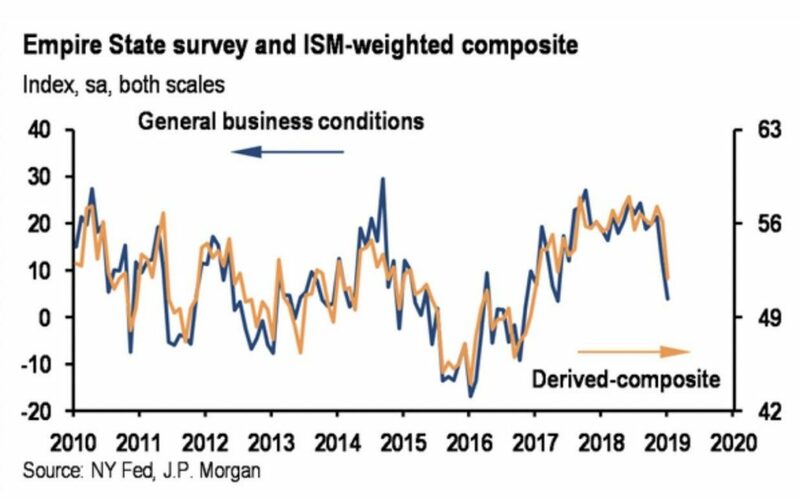 As you can see from the chart below, if you use the Empire Fed index as a model for the ISM manufacturing reading, the PMI report will be about 50. That would continue the index’s recent decline. The good news is services is outperforming manufacturing. Manufacturing is probably underperforming because it is more influenced by the international economy which is slowing rapidly. Germany just barely missed a recession as Q4 GDP growth was 0.1%. Let’s quickly review some of the Empire Fed’s components. The new orders index fell 9.9 points to 3.5. The prices paid index fell 3.8 points to 35.9 and the prices received index rose 0.3 to 13.1. The 6 month forward looking general conditions index fell 12.8 points to 17.8. The new orders index fell 15.3 points to 19.5. The capex index fell 13.3 points to 17.9. Finally, the technology spending index fell 6.1 points to 20. This report showed slightly positive growth, but it was terrible in rate of change terms. It’s volatile because it has a small sample size, so don’t change your entire thesis based on it. Since we see growth slowing, it supports our understanding of the economy. The December producer price index was very weak. Monthly headline inflation fell 0.2%. That missed expectations for no growth and 0.1% growth in November. This was the first decline since February 2017 and the largest decline since August 2016. As the chart below shows, on a year over year basis, headline PPI was 2.5% which was the same as last month. Monthly core PPI was down 0.1%. That was below the consensus for 0.2% inflation and less than last month’s 0.3% price gain. Core PPI was up 2.8% which was a slight increase from last month’s 2.7% rate. Finally, when you exclude food, energy, and trade services, monthly inflation was 0%. This missed estimates for 0.2% and last month’s reading of 0.3%. The most important takeaway from this report is core inflation was weak. We already knew the 5.4% decline in energy prices would bring down headline inflation. Weak core inflation allows the Fed to pause its rate hikes. The Fed should be dovish at its January meeting. The latest Merrill Lynch fund manager survey shows managers are very bearish. 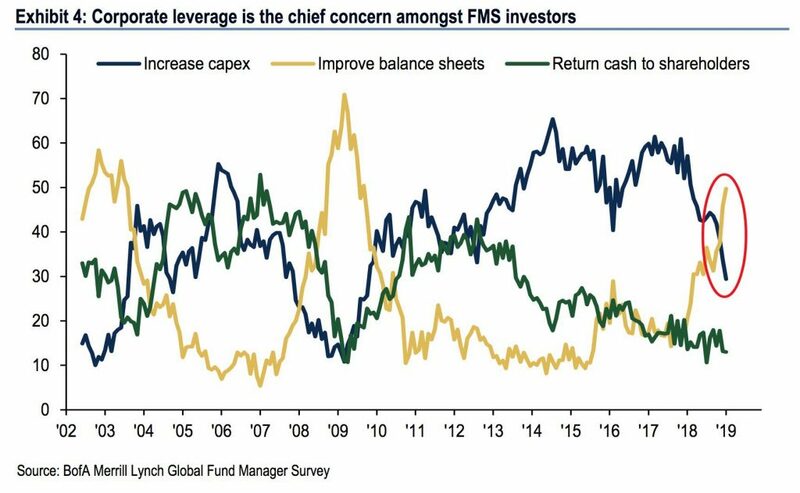 As you can see from the chart below, managers want firms to improve their balance sheets, and they don’t want them to increase capex or return cash to shareholders. A similar reading coincided with the last recession. Small cap firms are the most vulnerable to widening yield spreads. They should take this advice even if there isn’t a recession in 2019. The problem is they can’t improve their balance sheets because so many aren’t profitable. Stocks are soaring because they entered the year oversold. 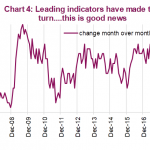 You shouldn’t ride the wave because earnings revisions look weak, the Cass Freight index is showing very low growth, and the Empire Fed index cratered in January. 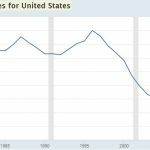 The manufacturing economy is barely growing. 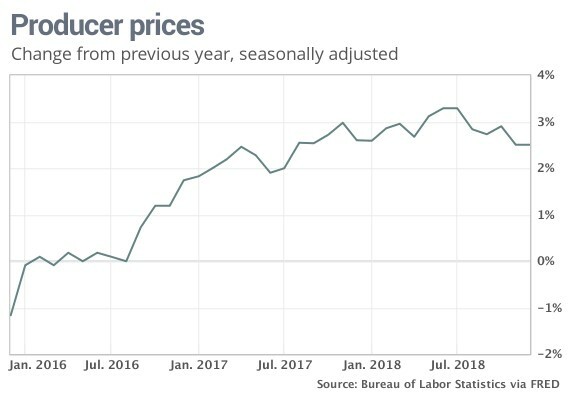 The good news is inflation is waning so the Fed can stop its rate hikes. Fund managers want firms to build up cash on their balance sheets, but many small caps can’t because they aren’t profitable.